Worries about rising tuition, soaring student debt and a stagnant job market has prompted a federal education panel to recommend suspending the ABA’s power to accredit new law schools for a year. The panel said it wanted to “send a signal” to the ABA, which has continued to green-light new schools while not withdrawing accreditation from a single existing institution since 2011. The move came at the June 22 meeting of the Department of Education’s National Advisory Committee on Institutional Quality and Integrity. Read the full transcript of that meeting here. The ABA, through its Council of the Section of Legal Education and Admissions to the Bar, has the authority to accredit law schools. For law schools, this is much more than a Good Housekeeping seal of approval – it’s key to survival. Accreditation helps schools attract new students and make them eligible for federal loans. It also qualifies graduates to take the state bar exam. 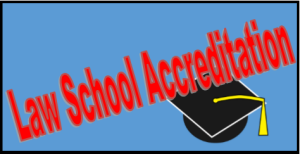 By the same token, the ABA must maintain its accreditation as an accreditor by the Department of Education, and it has to renew its credentials every five years. The ABA is up for renewal this year. And while in past years the process was relatively smooth sailing, this year it was anything but. The panel said the ABA is slow to help students but quick to protect faculty, citing as an example Standard 403, which requires full-time faculty to teach “substantially all” of the first-year coursework and more than half of all credit hours or two-thirds of student contact hours. The panel voted 6-4 to strip the ABA of accreditation powers for a year. The ABA says it might have to become “more paternalistic” in setting standards for student debt and requiring disclosure from schools on student loans. The DOE has tied career-college student aid to the income/debt ratios of recent graduates. Will it do the same for law schools? Are you a student or law professor? What are your views on ABA accreditation?